The TwinTec Vario 5565 represents, in every way, the optimum walk behind traction auto-scrubber with a range of advanced, yet practical, features that truly allow us to claim… “Best in Class”. 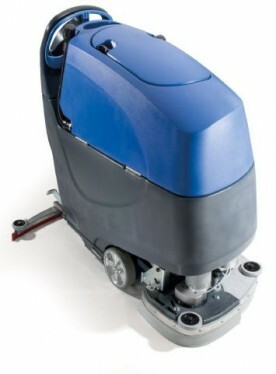 This TwinTec gets its Vario name from the fact that this one machine can, by a no tools adjustment and simple brush change, be set to operate at either a 55cm or 65cm scrubbing width… Two Machine Choices in One. In the 65cm mode the scrubbing head is automatically expanded to a practical offset operating mode, providing a 100mm head extension to the right hand side. This simple arrangement allows improved edge cleaning especially in aisles with racking or other obstructions. In normal operation the machine delivers a constant 40Kg of brush pressure but to this we have added a heavy duty spot cleaning feature, allowing the operator to select a 50Kg override setting at any time should it be required. Add to the exceptional cleaning performance, low noise and excellent manoeuvrability and you have a machine designed to deliver satisfaction on all counts.